Contains 180 rapid release softgels. Other Ingredients: Gelatin, Medium Chain Triglycerides, Vegetable Glycerin. Contains <2% of: Caramel Color, Titanium Dioxide. Contains: Soy and Tree Nut (Coconut). Neuro-PS 100mg is rated 4.9 out of 5 by 8. Rated 5 out of 5 by MM from Very good product. We had to go to the next step for my husband for his memory. This product seems to be working better than what we have bought in the past. We will be buying more of this product when this run out. Rated 5 out of 5 by Jazzmyne7641 from Does exactly what it says I love this product and I have been using it for years. I have recommended this product to many people. I didn't give the product an excellent rating for value only because it has gotten to be so expensive over the years, but I love it. 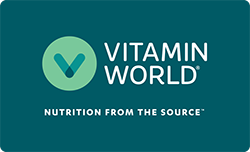 Please keep making this product Vitamin World and don't change the formula as it is wonderful!!! Rated 4 out of 5 by Anonymous from Good Product! Ordering on line a problem. Needed assistance got wrong pricing. Later gave me a discount number that does not work on orders. Been buying this product for over 15 years. Will buy in store in the future or order through the store. Rated 5 out of 5 by charsie956 from Excellent product. Take it like instructed and it helps. If I don't take on a daily basis, my memory gets worse. Taking Neuro-PS helps me speak without forgetting the words floating in mid air. Rated 5 out of 5 by Bentley from Great product Keeps me sharp.Been taking for years and it improves focus and recall.